Click! The belt hurriedly snapped into its groove. Thud! The log-like beefy black contraption strapped taut around my waist. Oops! 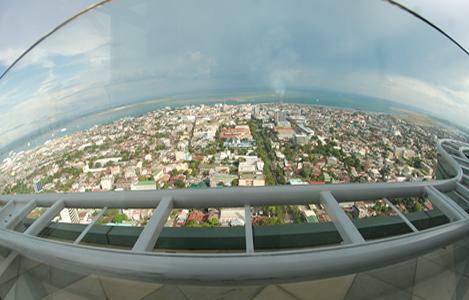 From the 38 th floor, Cebu looked absolutely petite. Phew! Tilted at 55 degrees, the world seemed anarchic - the sky had vanished, the sea had morphed into a fish bowl, the islands had clumped and the city shrunk into squiggles of green, blue and sorrel. Perched on a lime green seat outside the 38 th floor of Crown Regency Hotel, my heart pounded – what if the tiny joystick turned cranky and refused to reverse the tilt? What if the metal tracks cracked? What if….? Questions loomed and wishes flitted furiously. I wanted to mutter a prayer. Could an angel please lend the tindalo wood cross that Spanish conquistador Ferdinand Magellan had planted in Cebu on April 21, 1521 ? Exactly 3265.69 miles south east from home, I ached for a plucky knight in shining armour. Could the tall, burly tribal chieftain LapuLapu with sinuous mane and perfect abs rescue me with his sickle and shield? I yearned for divine intervention. Could god crank the clock fast, faster? Three minutes on the world’s first Edge Coaster stretched to eternity. In Cebu , it surely is woozy at the Edge. I survived. But Ferdinand Magellan didn’t. No, he did not fall off the edge; he merely squabbled with the patriotic LapuLapu. Nearly 600 years ago, Magellan had anchored by the island with five ships and 237 men in search of a westward route to the Spice Islands . Fresh from seven years in India , this page from the court of Queen Leonor, landed in Cebu that sits smack in the middle of Philippines , forms a part of the Central Visayas region. Do not blame Magellan’s fantasy of lording over the islands, on the map, Cebu looks like a long, narrow gobbet that fell off the god’s palette. Trust me, anyone would get tempted by the limestone plateaus, sugary beaches and rolling hills. Soon after arrival the plucky page hastily fashioned a crucifix, claimed the land in the name of Christ, held the first mass, built a Spanish kiosk with lime plastered walls and ondiola-tiled roofs in Cebu . But little did he know that death stealthily lay in wait. On April 27, 1521 , he was beheaded by LapuLapu in a lopsided war. Today, Cebu not only owes its piety to Magellan, but also its name. Rather, to a spelling howler by Pigafetta, Magellan’s Italian chronicler, who turned Sugbo to Zubuth, Zugbu, Zubu and finally Cebu . But in the beautiful city, appalling semantics were the least of my worries; I was ready to transcend history on four wheels – straight from Magellan to World War II. Actually, a War leftover called jeepney. Is it a jeep? No. Is it a jitney? No. Portmanteau the two and you get the jeepney, Philippines’ most iconic automotive, that is a knock-off of the surplus Willys and Jeeps that the American troops left behind after the War. The jeepneys have shed the camouflage green of the jeep; on the road, they create a splash with their fluorescent green, lemon yellow, vermillion red, peach pink, ink blue… However, there is more to the kitschy jeepneys than garish colours; some are flat-nosed, the Iliolos look like car replicas, the patoks come with high-power sound systems; E-jeepneys run on electricity and pricey vintage-style jeepneys are, well, pricey. With its countless motifs and large fonts, the jeepneys look like graffiti on the move, topped with snazzy chrome props. But getting into the crowded jeepney can be quite daunting, if you can manage ankle in, call it a feat. No, jeepney. I sighed. Next is what? I could dive in the emerald green water and steal a pearl for myself; ogle at Jumalon’s lepidomosaic paintings made of discarded butterfly wings; spend an evening amidst the twitter of birds in Olango; or dig my fork into Filipino specials like lumpia (spring roll), pancit (noodles), crispy buntot (fried tuna) or add sinful calories with halo-halo, the nation’s favourite dessert. That one day I had packed so much in Cebu that I wondered whether there was ever a need for tomorrow. But if tomorrow does come, I would light a candle for LapuLapu , Philippines ’ first hero. Yes, the one with sinuous mane and perfect abs.